Bunky is Emily Joyce, vocals and drums, Rafter Roberts, vocals and guitars, and a cast of San Diego’s finest, including members of Black Heart Procession, Pinback, Rocket From the Crypt, and label-mates Castanets. This all-star aggregation, backing Emily’s crazy beats, versatile vocals, and Rafter’s wall of guitars, blasts rawking tunes that careen through musical genres. Rafter Roberts, one of San Diego’s top music engineers, has worked with all of the above bands, plus the Kill Me Tomorrow, Bedroom Walls, The Album Leaf, Gogogo Airheart, Liz Janes, The Rapture, and many others. Emily joyce, also a recording engineer, has recorded live albums for Emusic by Mojo Nixon, Southern Culture on the Skids, Gogol Bordello, the Handsome Family, and Starlight Mints. 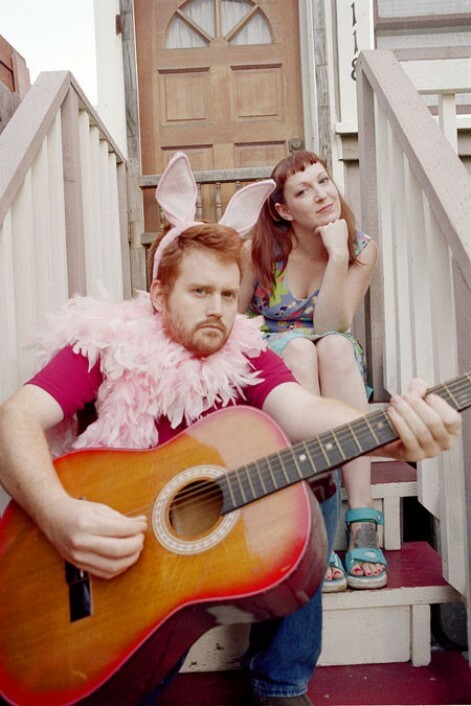 Known as one of San Diego’s premier live bands, Bunky was nominated for Best New Artist on “San Diego’s Best of 2003”, and Best Pop for the 2003 San Diego Music awards. Now, with “Born to be a Motorcycle,” Bunky blazes from the underground full-grown and ready to burn up the road.